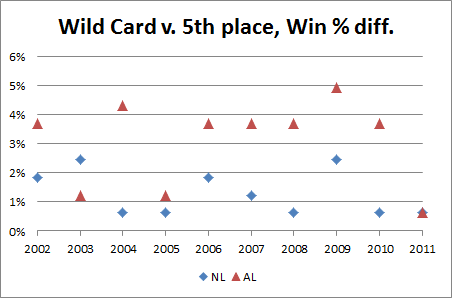 Not counting home-field advantage (which is weakest in baseball anyway), this represents the approximate binomial probability [thank you, again, binom.dist() function] of the team with the best record in the league [technically, a team that has an actual expectation against an average opponent equal to best record] winning a series of length X against the playoff team with the worst record [again, technically, a team that has an actual expectation equal to worst record] going in. The chances of winning each game are approximated by taking .5 + better win percentage – worse win percentage (note, of course, the NFL curve is exaggerated b/c of regression to the mean: a team that goes 14-2 doesn’t won’t actually win 88% of their games against an average opponent. 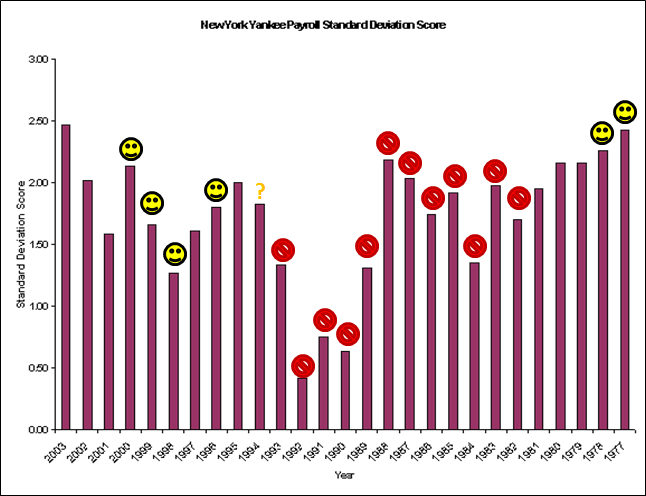 But they won’t regress nearly enough for their expectation to drop anywhere near MLB levels). The brighter and bigger data points represent the actual first round series lengths in each sport. By this approximation, the best team against the worst team in a 1st round series (using the latest season’s standings as the benchmark) in MLB would win about 64% of the time, while in the NBA they would win ~95% of the time. 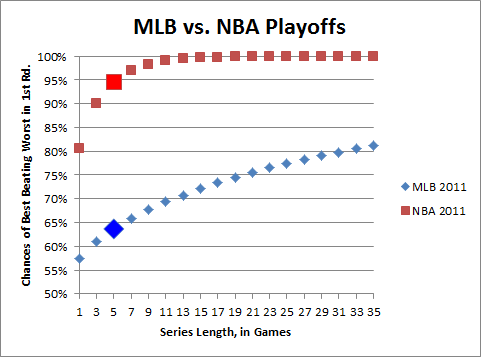 To win 2/3 of the time, MLB would need to switch to a 9 game series instead of 5; and to have the best team win 75% of the time, they would need to shift to 21 (for the record, in order to match the NBA’s 95% mark, they would have to move to a 123 game series. I know, this isn’t perfectly calculated, but it’s ballpark accurate). Personally, I like the fact that the NBA and NFL postseasons generally feature the best teams winning. Moreover, it also makes upsets more meaningful: since the math is against “true” upsets happening often, an apparent upset can be significant: it often indicates—Bayes-wise (ok, if that’s not a word, it should be)—that the upsetting team was actually better. In baseball, an upset pretty much just means that the coin came up tails. 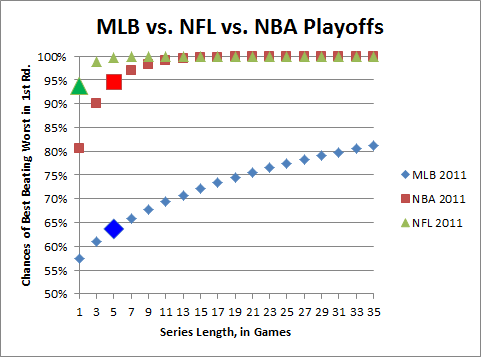 In the MLB vs. NFL vs. NBA Playoffs graph, the chances of best beating worst in first round for NFL for a 1 game series is almost 95%. Looking at the odds to this week’s NFL games, the biggest favorite was GB verses Denver and they were only an 88% chance of winning by the money line (-700). Denver is almost certainly not a playoff team, so it’s tough to imagine an even more lopsided playoff matchup that could get to 95%. What am I missing? I sort of addressed this in my longer explanation, but he’s not missing anything: the football effect is exaggerated. First off, to your specific concern, this early in the season there is even more uncertainty than in the playoffs. But second, and more importantly, this method for approximating a win percentage is less accurate in the extremes, especially when factoring in regression to the mean (which is a huge factor given the NFL’s very small sample sizes). In fact, the regression to the mean effect in the NFL is SO strong, that I think it helps explain why so many Bye-teams lose against the Wild Card game winners (without having to resort to “momentum” or psychological factors for our explanation). By virtue of having the best records in the league, they are the most likely teams to have significant regression effects. That is, their true strength is likely to be lower than what their records indicate. Conversely, the teams that win in the bye week (against other playoff-level competition), are, from a Bayesian perspective, more likely to be better than their records indicated. Think of it like this: there’s a range of possible true strength for each playoff team: when you match two of those teams against each other (in the WC round), the one who wins might have just gotten lucky, but that particular result is more likely to occur when the winning team’s actual strength was closer to the top of their range and/or their opponent’s was closer to their bottom. I’ve looked at this before, and it’s very easy to construct scenarios where WC teams with worse records have a higher projected strength than Bye team opponents with better records. 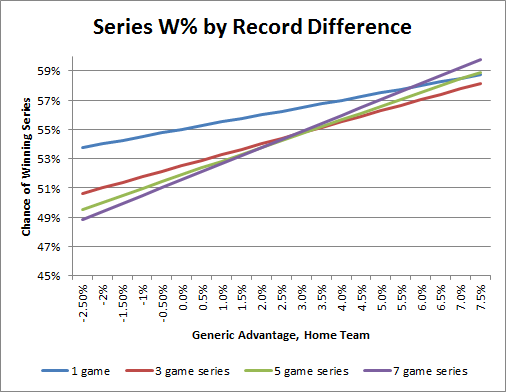 Factor in the fact that home field advantage actually decreases in the playoffs (it’s a common misconception that HFA is more important in the post-season: adjusting for team quality, it’s actually significantly reduced—which probably has something to do with the post-season ref shuffle: see section on ref bias in this post), and you have a recipe for frequent upsets. 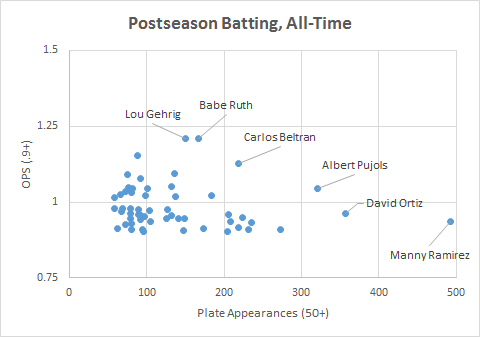 It’s a constant source of guilt for me that I don’t like baseball more, but I can’t help it: To me, the games are either not important enough to be interesting (98% of the regular season), or too important to be meaningful (100% of the playoffs). 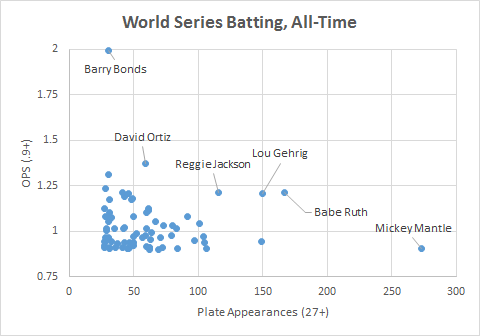 That said, I still dabble in baseball analysis myself, and I certainly understand the statistical appeal: the data-sets are huge, the variables are mostly independent, and—even in a post-Moneyball world—the screw-ups are ample. [Every Baseball Fan Ever]: Yeah. [Me]: You seriously [watch baseball] for fun? [Fan]: Well, not [minor leagues] or anything, but yeah. Don’t you? [Me]: Actually, [no leagues] is more my specialty. I’m an avid [non-baseball watcher]. [Fan]: You’re kidding, right? I mean, you know how to [watch baseball]..
[Me]: Well, I took the class.. [Baseball] and [I] are, like .. un-mixy things. [Fan]: It’s just because you haven’t had a good experience yet. You can have the best time [watching baseball]. It’s not about getting somewhere. You have to take your time. Forget about everything. Just.. relax. Let it wash over you. The air.. motion.. Just, let it roll. [Me]: We are talking about [baseball], right? 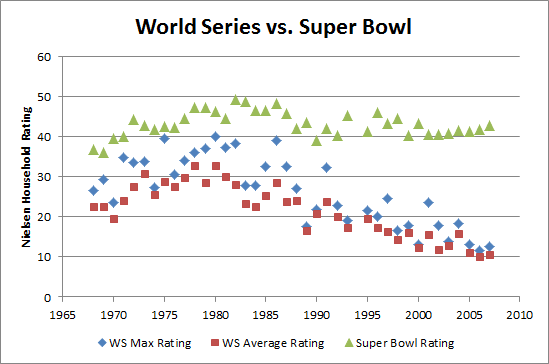 Since it’s inception, the Super Bowl has beaten even the highest-rated World Series game every single year (recently, it has even been beating the entire series combined for total viewers). OK, so with that out of the way: Once again, I’ll be live-blogging NFL Sunday from 10am until the final whistle tomorrow—now powered by NFL Sunday Ticket! Here’s the explanation, and here’s last week’s end product. Does cash rule everything in professional sports? Obviously it keeps the lights on, and it keeps the best athletes in fine bling, but what effect does the root of all evil have on the competitive bottom line—i.e., winning championships? For this article, let’s consider “economically predictable” a synonym for “Cash Rules”: I will use extremely basic economic reasoning and just two variables—presence of a salary cap and presence of a salary max in a sport’s labor agreement—to establish, ex ante, which fiscal strategies we should expect to be the most successful. For each of the 3 major sports, I will then suggest (somewhat) testable hypotheses, and attempt to examine them. If the hypotheses are confirmed, then Method Man is probably right—dollar dollar bill, etc. These one-word commandments may seem overly simple—and I will try to resolve any ambiguity looking at the individual sports below—but they are only meant to describe the most basic and obvious economic incentives that salary caps and salary maximums should be expected to create in competitive environments. Hypothesis: With free-agency, salary arbitration, and virtually no payroll restrictions, there is no strategic downside to spending extra money. Combined with huge economic disparities between organizations, this means that teams that spend the most will win the most. Note: Smiley-faces are Championship seasons. The question mark is for the 1994 season, which had no playoffs. Note: Green are Championship seasons. Red are missed playoffs. 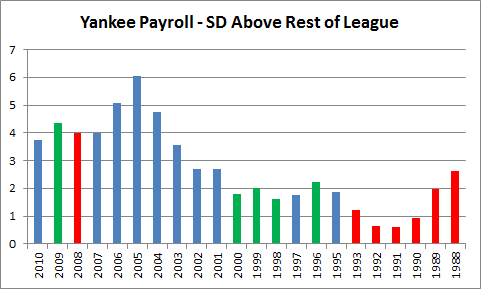 In 2005 the rest-of-league average payroll was ~$68 million, and the Yankees’ was ~$208 million (the rest-of-league standard deviation was $23m, but including the Yankees, it would jump to $34m). As they make up only 10% of the league, this means that the most spendy teams improved their title chances, on average, by almost a factor of 6. Hypothesis: A fairly strict salary cap reigns in spending, but equally strict salary regulations mean many teams will enjoy massive surplus value by paying super-elite players “only” the max. Teams that acquire multiple such players will enjoy a major championship advantage. Payroll information from USA Today’s NBA and NFL Salary Databases (incidentally, this symmetry is being threatened, as the Lakers, Magic, and Mavericks have the top payrolls this season). I will grant there is a certain apples-to-oranges comparison going on here: the NFL and NBA salary-cap rules are complex and allow for many distortions. In the NFL teams can “clump” their payroll by using pro-rated signing bonuses (essentially sacrificing future opportunities to exceed the cap in the present), and in the NBA giant contracts are frequently moved to bad teams that want to rebuild, etc. But still: 5%. Below expectation if championships were handed out randomly. And basketball championships are NOT handed out randomly. My hypothesis predicts that championship success will be determined by who gets the most windfall value from their star player(s). Fifteen of the last 20 NBA championships have been won by Kobe Bryant, Tim Duncan, or Michael Jordan. 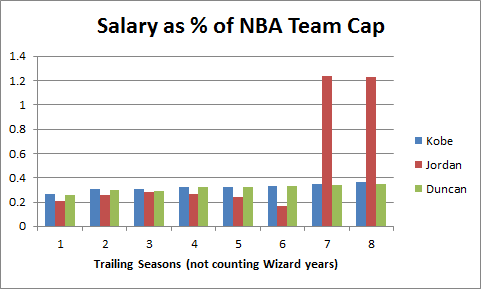 Clearly star-power matters in the NBA, but what role does salary play in this? Note: Michael Jordan’s salary info found here. Historical NBA salary cap found here. “It’s a dramatic, strategic judgment by a few teams,” says N.B.A. deputy commissioner Russ Granik. .
Says one N.B.A. executive: “They’re going to end up with two players making about two-thirds of the salary cap, and another pair will make about 20%. So that means the rest of the players will be minimum-salary players that you just sign because no one else wants them.” . . .
Granik frets that the new salary structure will erode morale. “If it becomes something that was done across the league, I don’t think it would be good for the sport,” he says. What these NBA insiders are explaining is basic economics: Surprise! Paying better players big money means less money for the other guys. Among other factors, this led to 2 lockouts and the prototype that would eventually lead to the current CBA (for more information than you could ever want about the NBA salary cap, here is an amazing FAQ). The fact that the best players in the NBA are now being underpaid relative to their value is certain. As a back of the envelope calculation: There are 5 players each year that are All-NBA 1st team, while 30+ players each season are paid roughly the maximum. So how valuable are All-NBA 1st team players compared to the rest? Let’s start with: How likely is an NBA team to win a championship without one? In the past 20 seasons, only the 2003-2004 Detroit Pistons won the prize without a player who was a 1st-Team All-NBAer in their championship year. To some extent, these findings are hard to apply strategically. All but those same Pistons had at least one home-grown All-NBA (1st-3rd team) talent—to win, you basically need the good fortune to catch a superstar in the draft. 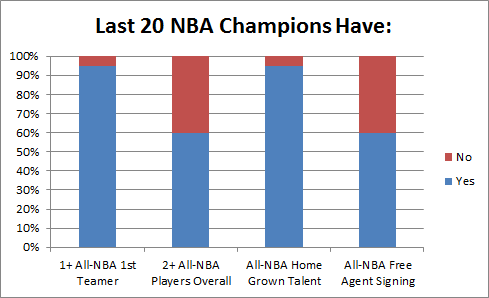 If there is an actionable take-home, however, it is that most (12/20) championship teams have also included a second All-NBA talent acquired through trade or free agency: the Rockets won after adding Clyde Drexler, the second Bulls 3-peat added Dennis Rodman (All-NBA 3rd team with both the Pistons and the Spurs), the Lakers and Heat won after adding Shaq, the Celtics won with Kevin Garnett, and the Lakers won again after adding Pau Gasol. Each of these players was/is worth more than their market value, in most cases as a result of the league’s maximum salary constraints. Also, in most of these cases, the value of the addition was well-known to the league, but the inability of teams to outbid each other meant that basketball money was not the determinant factor in the players choosing their respective teams. My “Recruit” strategy anticipated this – though it perhaps understates the relative importance of your best player being the very best. This is more a failure of the “recruit” label than of the ex ante economic intuition, the whole point of which was that cap+max –> massive importance of star players. Hypothesis: The NFL’s strict salary cap and lack of contract restrictions should nullify both spending and recruiting strategies. With elite players paid closer to what they are worth, surplus value is harder to identify. 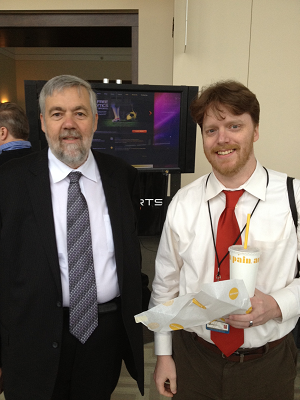 We should expect the most successful franchises to demonstrate both cunning and wise fiscal policy. 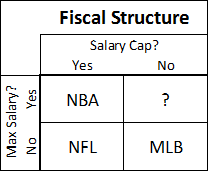 Analysis: Having a cap and no max salaries is the most economically efficient fiscal design of any of the 3 major sports. Thus, we should expect that massively dominating strategies to be much harder to identify. 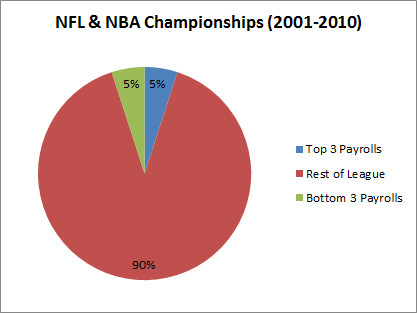 Indeed, the dominant strategies in the other sports are seemingly ineffective in the NFL: as demonstrated above, there seems to be little or no advantage to spending the most, and the abundant variance in year-to-year team success in the NFL would seem to rule out the kind of individual dominance seen in basketball. Note: WPA (wins added) stats from here. The obvious caveat here is that the entanglement question is still empirically open: How much do good QB’s make their teams win v. How much do winning teams make their QB’s look good? But really quarterbacks only need to be responsible for a fraction of the wins reflected in their stats to be worth more than what they are being paid. (An interesting converse, however, is this: the fact that great QB’s don’t win championships with the same regularity as, say, great NBA players, suggests that a fairly large portion of the “value” reflected by their statistics is not their responsibility). If a popular free agent intends to go to the team that offers him the best salary, his market will act substantially like a “common value” auction. Thus, beware the Winner’s Curse. 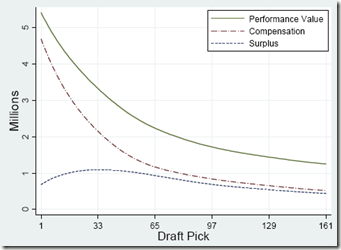 In simple terms: If 1) a player’s value is unknown, 2) each team offers what they think the player is worth, and 3) each team is equally likely to be right; then: 1) The player’s expected value will correlate with the average bid, and 2) the “winning” bid probably overpaid. Moreover, even if the winner’s bid is exactly right, that just means they will have successfully gained nothing from the transaction. Assuming equivalent payrolls, the team with the most value (greatest chance of winning the championship) won’t be the one that pays the most correct amount for its players, it will—necessarily—be the one that pays the least per unit of value. To accomplish this goal, you should avoid common value auctions as much as possible! In free agency, look for the players with very small and inefficient markets (for which #3 above is least likely to be true), and then pay them as little as you can get away with. 3. Treat your beloved veterans with cold indifference. If a player is beloved, they will expect to be paid. If they are not especially valuable, they will expect to be paid anyway, and if they are valuable, they are unlikely to settle for less than they are worth. If winning is more important to you than short-term fan approval, you should be both willing and prepared to let your most beloved players go the moment they are no longer a good bargain. 4. Stock up on mid-round draft picks. The implications of this outcome are severe. All else being equal, if someone offers you an early 2nd round draft pick for your early 1st round draft pick, they should be demanding compensation from you (of course, marginally valuable players have diminishing marginal value, because you can only have/play so many of them at a time). 5. When the price is right: Gamble. This rule applies to fiscal decisions, just as it does to in-game ones. NFL teams are notoriously risk-averse in a number of areas: they are afraid that someone after one down season is washed up, or that an outspoken player will ‘disrupt’ the locker room, or that a draft pick might have ‘character issues’. These sorts of questions regularly lead to lengthy draft slides and dried-up free agent markets. And teams are right to be concerned: these are valid possibilities that increase uncertainty. Of course, there are other possibilities. Your free agent target simply may not be as good as you hope they are, or your draft pick may simply bust out. Compare to late-game 4th-down decisions: Sometimes going for it on 4th down will cause you to lose immediately and face a maelstrom of criticism from fans and press, where punting or kicking may quietly lead to losing more often. Similarly, when a team takes a high-profile personnel gamble and it fails, they may face a maelstrom of criticism from fans and press, where the less controversial choice might quietly lead to more failure. The economizing strategy here is to favor risks when they are low cost but have high upsides. In other words, don’t risk a huge chunk of your cap space on an uncertain free agent prospect, risk a tiny chunk of your cap space on an even more uncertain prospect that could work out like gangbusters. Now, if only there were a team and coach dedicated to these principles—or at least, for contrapositive’s sake, a team that seemed to embrace the opposite. Oh wait, we have both! In the last decade, Bill Belichick and the New England Patriots have practically embodied these principles, and in the process they’ve won 3 championships, have another 16-0/18-1 season, have set the overall NFL win-streak records, and are presently the #1 overall seed in this year’s playoffs. OTOH, the Redskins have practically embodied the opposite, and they have… um… not. Note that the Patriots’ success has come despite a league fiscal system that allows teams to “load up” on individual seasons, distributing the cost onto future years (which, again, helps explain the extreme regression effect present in the NFL). Considering the long odds of winning a Super Bowl—even with a solid contender—this seems like an unwise long-run strategy, and the most successful team of this era has cleverly taken the long view throughout. The evidence in MLB and in the NBA is ironclad: Basic economic reasoning is extremely probative when predicting the underlying dynamics behind winning titles. 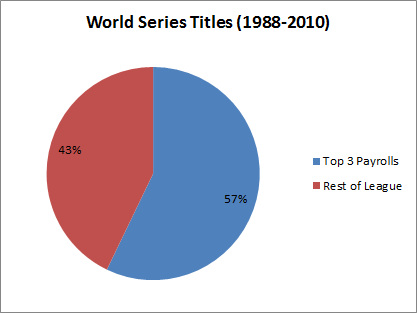 Over the last 20 years of pro baseball, the top 3 spenders in the league each year win 57% of the championships. Over a similar period in basketball, the 5 (or fewer) teams with 1st-Team All-NBA players have won 95%. In the NFL, the evidence is more nuance and anecdote than absolute proof. 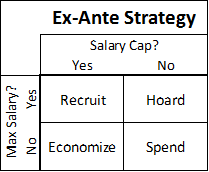 However, our ex ante musing does successfully predict that neither excessive spending nor recruiting star players at any cost (excepting possibly quarterbacks) is a dominant strategy. On balance, I would say that the C.R.E.A.M. hypothesis is substantially more supported by the data than I would have guessed. 1. The plate is not subjective. A STRIKE is a legal pitch when so called by the umpire, which . . . is not struck at, if any part of the ball passes through any part of the strike zone. . . .
2. The plate is not hard to check. They should be able to tell whether a solid ball passes over a small irregular pentagon. Yes, replay takes a while when you have to look at 15 different angles to find the right one, or when you have to cognitively construct a 3-dimensional image from several 2-dimensional videos. It even takes a little while when you have to monitor a long perimeter to see if oddly shaped objects have crossed them (like tennis balls on impact or player’s shoes in basketball). But checking whether a baseball crossed the plate takes no time at all: they already do it virtually without delay on television, and that process could be sped up at virtually no cost with one dedicated camera: let it take a long-exposure picture of the plate for each pitch, then instantly beam it to an iPhone strapped to the umpire’s wrist. He can check it in the course of whatever his natural motion for signaling a ball or strike would have been, and he’ll probably save time by not having players and managers up in his face every other pitch. 3. The plate is a waste of the umpire’s time, but not ours. Umpires are great, they make entertaining gesticulating motions, and maybe in some extremely slight sense, people actually do go to the game to boo and hiss at them — I’m not suggesting MLB puts HAL back there. But as much as people love officiating controversies generally, umpires are so inconsistent and error-prone about the strike zone (which, you know, only matters like 300 times per game) that fans are too jaded to even care. There are enough actually subjective calls for umpires to blow, they don’t need to be spending their time and attention on something so objective, so easy to check, and so important. I was just watching the Phillies v. Mets game on TV, and the announcers were discussing this Outside the Lines study about MLB umpires, which found that 1 in 5 “close” calls were missed over their 184 game sample. Interesting, right? So I opened up my browser to find the details, and before even getting to ESPN, I came across this criticism of the ESPN story by Nate Silver of FiveThirtyEight, which knocks his sometimes employer for framing the story on “close calls,” which he sees as an arbitrary term, rather than something more objective like “calls per game.” Nate is an excellent quantitative analyst, and I love when he ventures from the murky world of politics and polling to write about sports. But, while the ESPN study is far from perfect, I think his criticism here is somewhat off-base ill-conceived. The main problem I have with Nate’s analysis is that the study’s definition of “close call” is not as “completely arbitrary” as Nate suggests. Conversely, Nate’s suggested alternative metric – blown calls per game – is much more arbitrary than he seems to think. First, in the main text of the ESPN.com article, the authors clearly state that the standard for “close” that they use is: “close enough to require replay review to determine whether an umpire had made the right call.” Then in the 2nd sidebar, again, they explicitly define “close calls” as “those for which instant replay was necessary to make a determination.” That may sound somewhat arbitrary in the abstract, but let’s think for a moment about the context of this story: Given the number of high-profile blown calls this season, there are two questions on everyone’s mind: “Are these umps blind?” and “Should baseball have more instant replay?” Indeed, this article mentions “replay” 24 times. So let me be explicit where ESPN is implicit: This study is about instant replay. They are trying to assess how many calls per game could use instant replay (their estimate: 1.3), and how many of those reviews would lead to calls being overturned (their estimate: 20%). Second, what’s with a quantitative (sometimes) sports analyst suddenly being enamored with per-game rather than rate-based stats? Sure, one blown call every 4 games sounds low, but without some kind of assessment of how many blown call opportunities there are, how would we know? In his post, Nate mentions that NBA insiders tell him that there were “15 or 20 ‘questionable’ calls” per game in their sport. Assuming ‘questionable’ means ‘incorrect,’ does that mean NBA referees are 60 to 80 times worse than MLB umpires? Certainly not. NBA refs may or may not be terrible, but they have to make double or even triple digit difficult calls every night. If you used replay to assess every close call in an NBA game, it would never end. Absent some massive longitudinal study comparing how often officials miss particular types of calls from year to year or era to era, there is going to be a subjective component when evaluating officiating. Measuring by performance in “close” situations is about as good a method as any. Which is not to say that the ESPN metric couldn’t be improved: I would certainly like to see their guidelines for figuring out whether a call is review-worthy or not. In a perfect world, they might even break down the sets of calls by various proposals for replay implementation. As a journalistic matter, maybe they should have spent more time discussing their finding that only 1.3 calls per game are “close,” as that seems like an important story in its own right. On balance, however, when it comes to the two main issues that this study pertains to (the potential impact of further instant replay, and the relative quality of baseball officiating), I think ESPN’s analysis is far more probative than Nate’s.